Minecraft Glide Giants Track Pack for PS4, PS3, Xbox One is now available for download. The developers also released Minecraft update for PS4, PS3, Xbox One and other devices. The new ‘Giants’ Glide track pack, featuring a trio of deadly acrobatic challenges in which players swoop around oversized furniture, weaving between the limbs of massive mobs. The new Mobs track is a big comes with everything massive and big – the landscape is big, the plant-life is big – it really gives you that Minecraft experience on a gigantic scale. The Shrunk track carries on the theme from Battle’s bedroom-bsed track of the same name. It comes with a giant house with a tiny character. 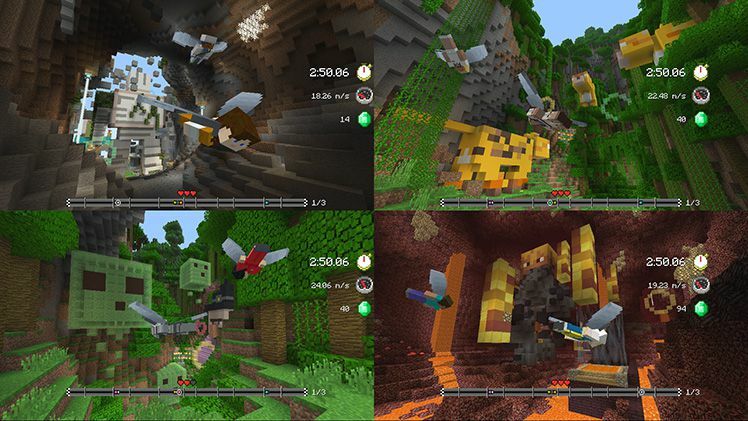 There are even sections where you can fly through a television and into Minecraft itself. Finally, the third new track takes you inside the human body. Check out the DLC pack for yourself on Console Edition today with the latest Minecraft for PS4, PS3, Xbox One and other devices.